Bumble bees feed on nectar from flowering plants and are a beneficial insect because they pollinate crops and other plants. Bumble bees are social, typically nesting in the ground, but can be found above ground around patio areas or decks. 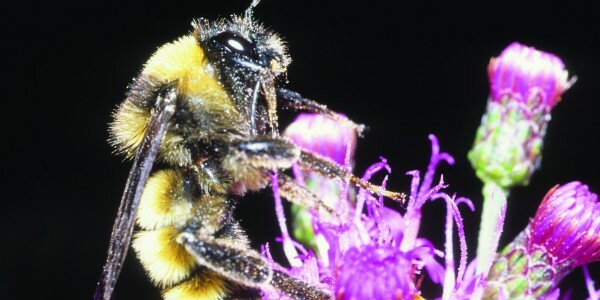 Bumble bee colonies only survive for 1 year, dying in the fall. New nests are started in the spring by young queens which have successfully hibernated through the winter. They will sometimes build their nests in soffits of attics or other sites around houses or buildings. A disturbed bumble bee will buzz loudly. These bees will defend their nests aggressively, especially later in the summer season when nests are larger. Although not normally aggressive, bumble bees will actively defend their nest from intruders, who they may chase for a considerable distance. A bumble bee’s sting is painful and their stinger does not have barbs meaning they can sting more than once.